Root Cause Analysis of Systems Failure - Comprehensive: Customized onsite course taught by Best-in-Class Eogogics instructors in Washington, DC, Virginia, USA, worldwide. Basic metallurgical and electronic component evaluations. Day 5 (Workshop Day): Participants will work together to analyze a failure specific to your organization. 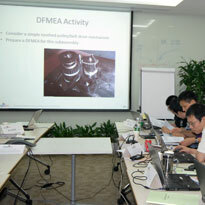 The workshop day can be scheduled a few weeks after the first four days of this course to allow time for “home work”. This four- to five-day course brings together important concepts from engineering, quality assurance, problem solving, procurement, and other disciplines to identify and eliminate the root causes of failures occurring in complex systems, subsystems, and components. We will show you how to utilize fault tree analysis for identifying potential failure causes. We will also arm you with procedures and technologies for working through various types of systems failure. We will learn how hardware analysis, statistical analysis, design of experiments, technical data package evaluation, and other pertinent tools and techniques can be brought together to define root causes of a failure and to develop a plan of corrective actions. The course will utilize real-life case studies to help you apply this toolkit effectively to your job. At the end of the course, you will have learned how to identify dominant failure modes through quantity and cost-based Pareto analyses, identify the root causes of systems failures, select and implement effective corrective actions, and work as an inter-organizational, multi-disciplinary failure analysis team. Add a more in-depth discussion of the design-of-experiments and Taguchi training. Schedule post-class follow-up consultation for continuing in-house product and process failure analyses. Work together in an effective multi-disciplinary team environment to resolve complex system failures. Objectively identify all potential failure causes using fault tree analysis, design of experiments, and other technologies. Objectively evaluate the likelihood of each potential failure cause. Identify the most likely failure causes. Proactively eliminate additional potential failure causes before they occur. This course is aimed at manufacturing engineers, quality engineers, project engineers, design engineers, MRB engineers, procurement specialists, manufacturing managers, program managers and others responsible for preventing or determining the cause of a systems failure. While there are no formal prerequisites, the course does assume experience in an industrial, manufacturing, or engineering development/maintenance setting.